Fels Naptha soap is used for laundry, stain removal, treating poison ivy, and other household chores. Sometimes it can be difficult to find at your local market. This is a guide about buying Fels Naptha soap. Who sells Fels Naptha laundry soap? Well, Fells Naptha is made by Dial which in turn is owned by Henkel corp of Scotsdale Arzona. You can buy the soap at Amazon.com or My Brands at 888-281-6400. You may also try calling the Henkel Company at 888-468-6673 and see if they can locte a store near you. You can also order it from www.VermontCountry Store.com. I just saw it in their new catalog that came today. Talk about timing! Question: Where Can I Buy Fels Naptha in Ontario Canada? I have been looking for Fels Naptha for quite sometime and am wondering if you could direct me to where to buy it in Barrie? I get mine at www.soapsgonebuy.com, they have all sorts of products and some good sales as well. 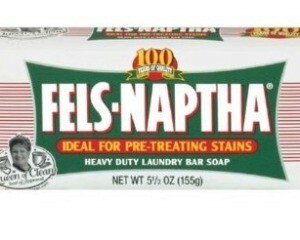 Where in California can I buy Fels Naptha soap? You don't say what city you live in, but www.felsnaptha.com has a section on it where you can find out where to buy the soap. I live on the central coast, and have bought it at both Albertson's and CVS. I'd also try ebay and Amazon. I am trying the recipe posted for laundry detergent. I cannot find the Fels Naptha soap or the washing soda in our small town. Any help in locating those items? I searched Walmart's website and could not find it listed with them. Also where can the essential oils be purchased? Can another soap be substituted for the Fels Naptha? Where can I get the essential oils? Please someone respond asap. Kirks or Zoat soap can be used instead of Fels. I use Zoat, it's cheap and comes in a huge bar. As for the washing soda, I think the Arm and Hammer web page has a number you can call to locate it in your state. If that doesn't work, there's a website you can order all that stuff from. You can get the washing soda and Fels Naptha soap at Krogers in the detergent section or you can get them online at www.soapsgonebuy.com, but it will cost a bit more. You can also use Ivory or a deodorant soap, but the Fels soap is best. I also put in some all purpose bleach with the washing soda and the borax using the same amount of each. The essential oils can be purchased at a health food store or online at www.iherb.com. Just scroll down to the bottom page and essential oils will be there. I just use some lavender perfume oil that I purchased at the Family Dollar Store for $2.00 or don't use any at all. You can put a capful of fabric softener to 2 capfuls of water and place in a enclosed container with a small sponge and wring the sponge out and place in dryer with clothes. Then put the sponge back into container for the next load of clothes! I use Tide, washing soda, and borax. Have you looked in the laundry isle of the grocery store. I have no trouble finding it. It is made by Arm & Hammer so a possible Google search may work for you to find it. I do not add scent to my mix at all. Can Homemade Soap Containing Fels-Naptha Cause a Rash?